Perma-Chink log home chinking looks like traditional mortar. It stretches, compresses and tightly adheres to log surfaces to make your log walls weather tight and attractive. Perma-Chink is still the easiest and most durable log chinking to apply to your log home. I'm a log homeowner who stands behind Perma-Chink's chinking, lifeline stains, Advance top coat, log end seal, energy seal and every other product offered. My logs are hand-hewned with the original style chinking so we used I think 25 pails of chinking and none of it has failed. The chinking is tops, stain is very durable and easy to apply. The log end seal on my dovetails has preventing unwanted checking and weathering on the ends. The entire staff a Perma-Chink always goes the extra mile when I call and ask questions or for advice. Perma-Chink has the best customer service of any company period in all types of industries I interact with. Unbelievable!! I chinked a 30 year old log home I recently purchased. The house had been unoccupied and unfinished. The first winter I froze. After chinking the next year, by myself I might add, I am finally warm. The product was easy to use. Thank you. I just started using perma chink in September. I love the quality of the chinking . I always get fast an friendly service when make a order. Steve in the warehouse was really helpful today when i was having a problem with my chinking gun.i would recommend perma chink to everyone. Best product we found for sealing gaps. Looks very nice! We have ordered the stone perma-chink several times and are always amazed at how fast it is shipped! Usually get it within 2 days. Highly recommend this product and company! Great product. We tried Log-Jam, but were not too impressed. Permachink is easy to work with and very forgiving for beginners. I appreciate the videos on the site as well. And they ship it really fast. Very impressed. I began using Permachink when i began working in a log cabin community as a contractor in 2012. I have ordered both the tubes and the 5 gallon bucket with plate and loading guns and while both are easy to use I prefer the 5 gallon bucket for quickness of loading when doing whole cabins. I couldn't be happier with how easy this product is to apply, how nice this product makes a cabin look, and how after years of checking back on cabins I have redone that the quality has held up. All of my customers are happy with it, and that leaves me ecstatic! Delivery is super quick - I've never had it take more than 3 days to get my product., and they have excellent customer service. This site has been super informational and introduced me to a lot of different log products that I now use and recommend to all of my clients. You have a customer for life. Just a Thank You to both Brad and Amie who answered a lot of questions about chinking on the chat that's provided here. It was a great help, and the home is now airtight and lots warmer than last winter. Thanks again both of you for sharing your knowledge and patience with me! The fastest shipping I have ever had, anywhere!!! I just want to "Thank You" for your prompt service. I placed a small order on Thursday (Sept. 14th) and was so surprised to receive it the very next day. We have found your products to be top notch! Again "Thank You"! Hey Perma-Chink, I just want to say thank you for e-mailing us those maintenance tech-tips, soooo helpful! Thanks Perma-Chink! Top-notch service! We used this on our wide gaps between our square logs. It is, simply stated, awesome!!!! Easy to work with once we got the backer all cut (one piece at a time, took forever) and really, no learning curve. Gives a very authentic appearance like we were trying to achieve! We used Perma-Chink in the Tan color between our logs and I have to admit it looks really good. It is still very soft (just applied it a few days ago), but it says it takes a few weeks to cure. So far so good! We used the Stone Perma-Chink to chink our log home, and it looks just like mortar, which is exactly the look we were after. Very happy customers! This synthetic mortar chinking was recommended by our manufacturer and it seems to work pretty well so far....time will tell if it holds up. While researching Log Home Chinking, Perma-Chink kept coming up. We ordered a catalog and received a whole packet of information that included a brochure that explained our upcoming journey perfectly. We ordered the chinking, bulk loading gun, follow plate, and backer rod, and with the help of the on-line videos and an on-line chat with the company (Amie was very helpful!!) we were able to accomplish this task. Great chinking product as well as the technical back-up for us as well. We're very satisfied customers!! We used this on a 1880's log cabin that used to belong to my great great grandparents, and it looks just like mortar does. Perfect match to the period we were trying to get the look for. Easy to apply and clean up, and the stone is the perfect color. Really nice log home chinking, we're very happy! I bought a log cabin made of 6x16 logs and mortar chinking. I would have preferred it had perma chink in the first place, but when the logs dried out enough to show gaps in the chinking I used perma chink and backer rod to fill them. Already have 2 winters and summers on it and it still looks great. Planning on continuing to the inside this year. Thanks! We used the Stone colored Perma-Chink on the interior of our house a few winters ago and are very pleased with how it completes the inside look of our home. We heat with a gas fireplace and wood stove and the chinking has reduced our heating costs by sealing around the doors, windows, and especially along the purlin logs and the tongue-and-grove ceiling. I purchased an Appalachian style log cabin with deteriorating exterior chinking that had never been applied properly. Because of the amazing help that I received from this company, I've begun the process of replacing the chinking with tan Permachink. I am using the 5 gallon pails, the follow plate, the bulk loading gun, and other items that were recommended. It is holding up beautifully. They were such a help to me and very encouraging and patient! After a couple of years, the first section has remained in perfect condition! I am so thankful that I took their advice on paying attention to the details! I love the way our chinking looks on our log home! We put Grip Strip in between our logs and then applied Medium Gray Perma-Chink over it. It was pretty easy to apply once we got the hang of it, although it took us a few days to finish the job. Overall, I am pleased. Thank you! Great product, saving a whole lot of money by keeping the cold out, and fantastic people to talk to at the store too!! I'm a customer for life! It's easy to work with, and within a few minutes I was moving right along. Can't say enough! 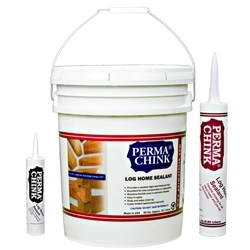 Perma-Chink is still the best in the industry, been using it on jobs for 17 years now and it has never failed me. I LOVE this stuff, easy to work with, lasts forever, and the Perma-Chink staff are the best, far and away!!! Order over the phone or on line and it's here in a day or two! "Perma-Chink is an easy to apply and work sealer that gives the look of old mortar. I love that it is even easier to clean up...just soap and water! Great product and great colors!.